The goal of this series is to introduce students to the rhythms, harmonies and other unique characteristics of jazz. 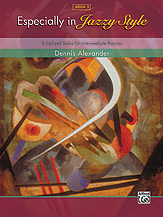 Students will be motivated by the variety of styles and sounds that have that special Dennis Alexander sound. From lyrical melodies to infectious rhythms and harmonies, playing jazz styles has never been more fun! Titles: Cool Dude! * Jazz Nocturne in B-flat Major * New Year's Waltz * Only Time Will Tell * Ragtime Boogie Blues * Stompin' the Blues Away * Summer Moon * With Mixed Emotions. "Cool Dude!" and "Stompin' the Blues Away" are Federation Festivals 2014-2016 selections.